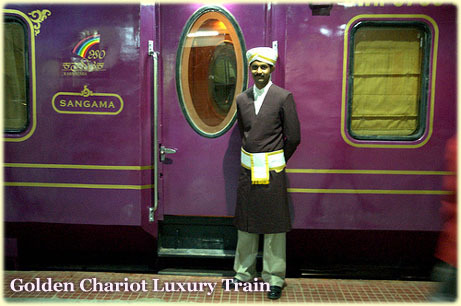 The Golden Chariot is a luxury tourist train that connects the important tourist spots in the Indian states of Karnataka and Goa. The 19 coaches on the train are colored purple and gold, and sport the logo of a mythological animal with the head of an elephant and a body of a lion. 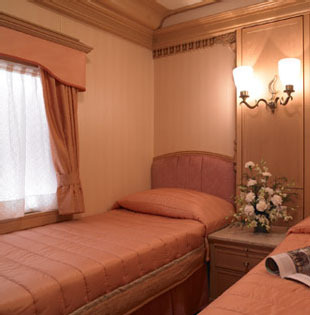 The train, along with the Deccan Odyssey, is designed on the lines of the more popular Palace on Wheels with accommodations, spa treatments and dining services. The train offers a 7 day & 8 night tour of Bangalore, Kabini, Mysore, Hassan, Hospet, Badami and Goa, before returning to Bangalore. The tourist attractions visited include the Nagarhole National Park, Mysore Palace, Srirangapatna forts, Hoysaleswara Temple, Gomateshwara and the Badami Cave Temples. Passengers have the option to start their trips from either Bangalore or Goa. The Golden Chariot will also offer an extended two week tour that will cover Coimbatore, Madurai, Kanyakumari, Trivandrum, and Kochi during the second week.